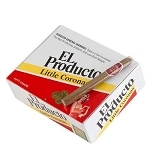 Since 1916, El Producto’s have been the symbol of the classic American-made cigars. Today as always, they remain a very smooth and tasty machine made smoke. And despite all of his Hollywood friends preferring top-of-the-line Havana’s, George Burns’ favorite smoke was the El Producto. So try the cigar that the beloved comedian was rarely seen without! And who knows, maybe if you keep smoking them, you will also live to be 100!